Deeper, nickel-plated grooves on the pole allows easier pulling. Reinforced breech. Extra long pipe sections for large breed cows. Blue molded plastic handle for comfortable cranking. 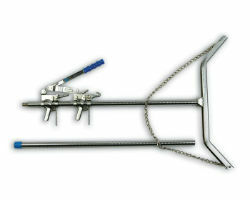 Two longer ratchet release levers are formed to the fingers. Ratchet moves smoothly up and down pole. Deeply cut threads in pipe sections prevent ratchet from slipping. Three hooks to attach O.B. strap or chain. Approximately 64".